A pilot aimed at helping lower-income groups eat better will encourage them to buy healthy foods, and feature cooking demonstrations and prominent displays of nutritious options. 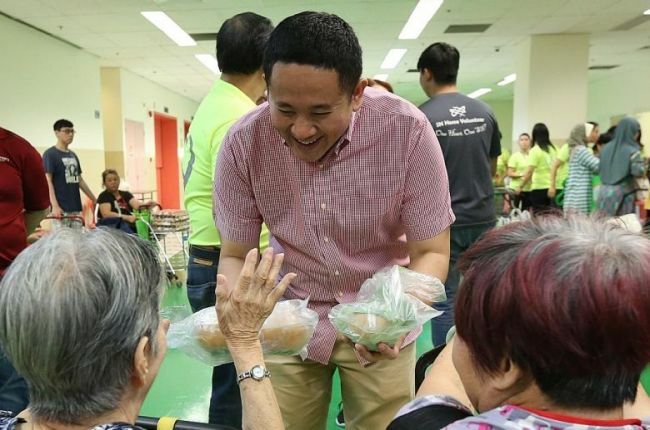 Launched by the Health Promotion Board (HPB), the pilot is expected to help about 200 families in the Kembangan-Chai Chee neighbourhood. The board will also study how the programme can be expanded. Senior Parliamentary Secretary for Health and for Home Affairs Amrin Amin said at a community event yesterday that the pilot makes "incremental changes" to diets in a move to improve health. Mr Amrin said at a one-day supermarket event held in Viva Business Park in Chai Chee: "Habits are not easy to change. It takes time to wean out sugar (for example)." The pilot, which runs from January to June, includes new guidelines for donors on picking healthier food products for beneficiaries. An HPB spokesman said the board will work with donors to review the food products in donation packs for beneficiaries, and recommend how to improve their nutritional quality. The packs should contain products with HPB's Healthier Choice symbol and fewer snacks, sauces and condiments, among other things, he said. The pilot also complements existing neighbourhood projects such as the 100=50 initiative that gives poorer families a 50 per cent discount when they shop for groceries at an invite-only, pop-up supermarket once a month. At the temporary supermarket, six HPB-trained volunteers teach the beneficiaries how to read food labels and make healthier purchases. The board also organises other activities such as cooking demonstrations to promote healthier cooking methods and recipes. Technician Loo Leong Hock, 58, said in Mandarin that the 100=50 initiative that started in his neighbourhood in January last year has helped him financially. He knows of the healthier eating options promoted at the supermarket, but his primary concern is the rising cost of groceries. Mr Loo, who lives with his wife, their two children and his mother-in-law, said: "Prices are still the most important factor." Bus driver Faruk Abdullah, 54, who lives with his wife and their four children, said "the lower costs have helped me make healthier choices for my family". He spends about $200 a month on groceries, half of what he used to spend. Lower-income groups here have poorer health than the general public, according to two recent Singapore General Hospital studies on those who live in rental flats. Living in rental flats increases one's risk of being a frequently admitted hospital patient, which refers to three or more inpatient admissions in a year, and is also linked to a higher mortality rate, the studies found. Mr Amrin said the pilot programme gives residents a chance to try out healthier ingredients and to show them the food "can still be tasty, perhaps different, but still tasty". There are plans to scale the programme to help more people improve their diet, he added.